It’s been 2 years since Assembly Coffee opened at Evans Road. How time flies! I remember I was so happy to have a 3rd wave cafe opening near my work place, and since then, Singapore has been inundated, with cafes galore. What a difference 2 years makes. Despite my love for coffee, I’m not one of those who needs a fix every day. I don’t get a buzz from drinking coffee, and I can have it even at night. It’s more of the idea of relaxing over a cup of beverage that perks me up, so I’ve only visited Assembly Coffee once in a while, when my colleagues have time during lunch to sit down for a cuppa, which is not all that often. I actually dislike doing takeaways as it just defeats the purpose for me. Anyway, last weekend I was back in the office to do some clearing up and decided to indulge a bit by getting their waffles. 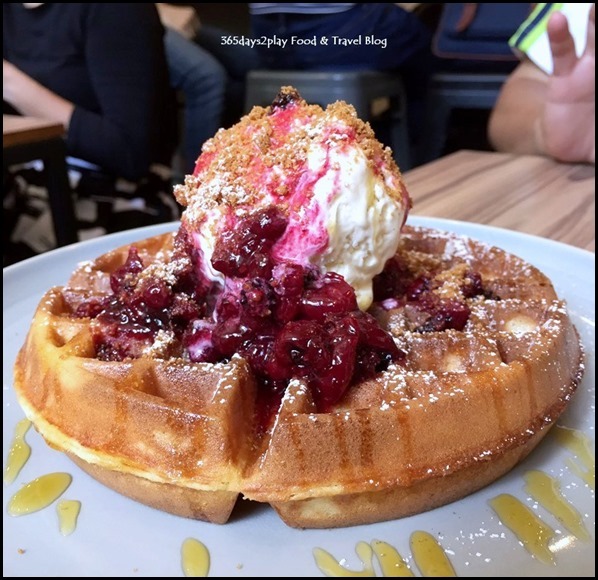 Assembly Coffee is not just known for its coffee, they do a mean waffle too. 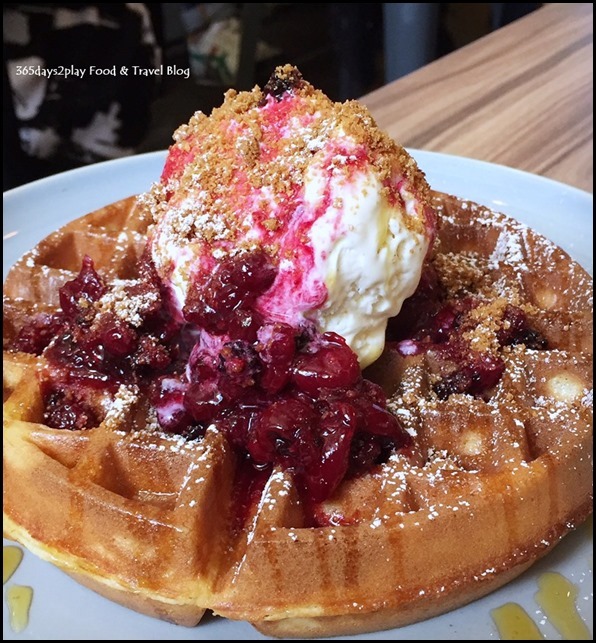 There are currently 5 waffle options on the menu and the 3 of us decided to share the mixed berry compote with vanilla ice cream one. I must say the 3 of us unanimously agreed that the waffle was fantastic. The waffle was crispy on the outside, but still fluffy on the inside. We don’t really like waffles that are just crispy throughout, then it feels like we’re just eating crust or something. 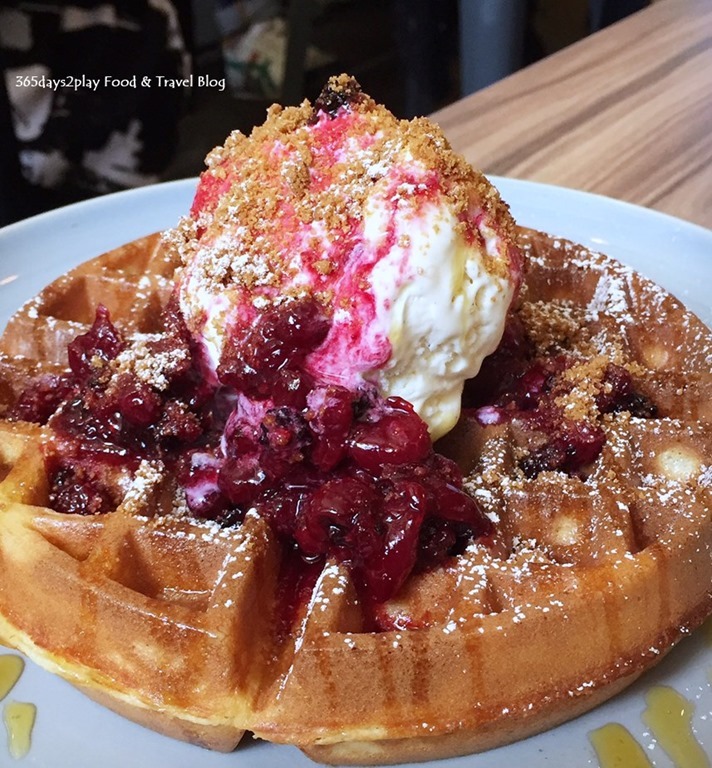 The generous dollop of vanilla ice cream and mixed berries went really well with the waffle, softening the crispy exterior. Being the sweet toothed me, I wouldn’t mind if it were just a little bit sweeter though. 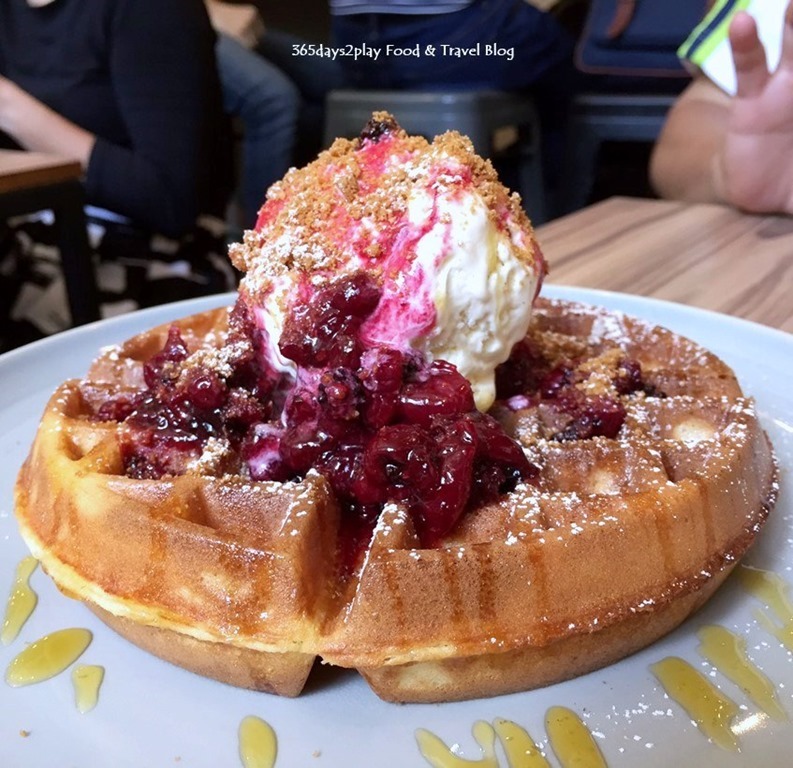 Even the taste of the waffle itself was slightly different from the more one dimensional versions that you get from average cafes. I guess it’s the buttermilk at work. Another waffle picture just for the fun of it. Scroll down if you want to see Assembly Coffee’s 2016 menu.